An engagement ring is likely one of the biggest purchases you’ll make with your partner. It’s important to love every aspect of your ring, and one way to guarantee this is by creating your own custom engagement ring in DC. The experts at Charles Schwartz can help you and your partner through the whole process of designing the ring to make sure you’ll love it for the rest of your life. First, it’s important and practical to think about your budget and how much you are willing to spend on an engagement ring. You don’t want to go into the process and create the perfect ring only to realize it is way outside of your budget. It’s also smart to familiarize yourself with the four C’s: carat weight, cut, color and clarity. Diamonds vary in price based on these four C’s, so knowing what to look for will help you in deciding what type of diamond to choose. Creating your own engagement ring also gives you the opportunity to choose a more unique center stone. Diamonds are a popular choice but both sapphires and emeralds are becoming a trendy choice. 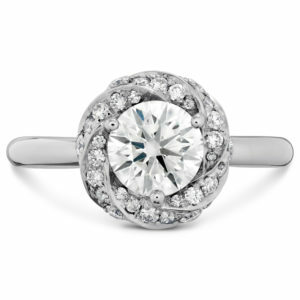 You could even choose your significant other’s birthstone to add a thoughtful touch. Do you want a simple band or embellishments? Rose gold or silver? Think about what type of jewelry you wear now and what pieces are your favorite. Keeping your preferences in mind will help you decide on the ring’s style. The experts at Charles Schwartz are knowledgeable jewelers who can help you through the process of creating an engagement ring. If you have something unique in mind, we can help you create the custom engagement ring of your dreams. Whether you plan to shop for your ring with your partner, or plan to completely surprise them, we are here to help you create that forever ring. If you’re looking to create a custom engagement ring in DC, contact Charles Schwartz today and our expert jewelers can help create the perfect ring.